Saturday, May 2, 2015 from 10:00 to 1:00 at ??????????????????? ?Hawthorne Hill Nature Center 28 Brookside Drive Elgin, IL. near I-90 and Route 20.?Native plants refer to hardy perennials, trees and shrubs that are indigenous to our area. 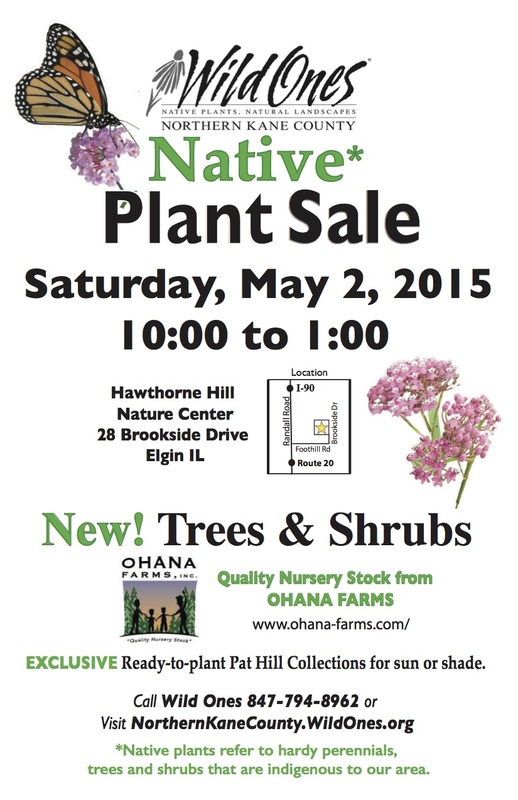 Northern Kane County Wild Ones will be holding their 3rd annual native plant sale on Saturday, May 2, 2015 from 10-1 at Hawthorne Hill Nature Center in Elgin, IL. Native flowers and grasses will be offered for sale. In addition, Ohana Farms, of 3511 Millstream Road, Marengo, IL, will be selling a selection of their native shrubs and trees. What is a native plant? Why plant native plants? Native plants refer to hardy perennials, trees and shrubs that are indigenous to our area and were present prior to European settlement. Native plants evolved to be grown in local conditions. 1/3 of the dense root systems of prairie grasses and sedges decompose every year, enriching the soil with organic matter and increasing its water-holding capacity. The longer roots of forbs (some as deep as 15 feet) draw water deep into the earth, replenishing the shallow aquifer. This water infiltration and holding capacity prevents runoff, erosion, and flooding. In addition, deep-rooted plants sequester carbon, that is, they draw in carbon from the atmosphere and store it in their leaves and deep roots. Excess carbon in the atmosphere is a contributor to global climate change. ???????? ?Native flowers, sedges and grasses will be available. EXCLUSIVE ready-to-plant Pat Hill Collections for sun or shade. New this year purchase quality trees and shrubs from?OHANA FARMS. For information visit our events page or call Wild Ones at 847-794-8962. I would like to get native species of cat tails, milk weed & thistle for a wet area of my yard. It is the ‘ditch’ area between the road and my yard. The rain water runs under my driveway and pools up making a swampy spot. I thought about digging some up from a spot nearby and transplanting. However, I want native species and I was warned about aggressive thistle. Also, I think this would need a wetland species. Will you be selling these at the plant sale on May 2? If not, where can I find them? I am pretty sure we will not be selling cattails, not because they are not native, but because they are an aggressive native. Our local forest preserves and park districts work hard to keep it under control in their wetlands. I would not suggest it for what I assume is a pond in your yard. I don’t think we will be selling native thistle, but I will forward your question to the plant sale committee. You are correct, much of the thistle around is non-native and is a particularly invasive plant. In fact, farmers are required by law to spray herbicides for it. I will check to see if we are selling milkweed, Milkweed has become very popular because of the need for monarch butterflies to use it. In fact the state of Illinois is going to plant it along some of the state highways. You can find milkweed seed in many places. There will be many native plant sales coming up in the spring which I am sure will have the plants for sale. On the same weekend as ours, the Wildflower Preservation Propagation Committee will have a plant sale at McHenry College in Crystal Lake, and the Citizens for Conservation in Barrington will have their sale the Sat. and Sun. May 2 and 3. If you are local, Wasco Nursery will be carrying Natural Garden Natives and will probably have milkweed as well. I will have our plant sale coordinator get back to you as to whether we will have the plants. Kim Haag, Communications. Here are additional native plant resources including plant lists for wet, mesic and dry areas.